As connectivity to the outside world grows, security is becoming one of the most important topics in industrial IT and OT. Industrial cybersecurity developed into a board level topic during 2017. But what do user companies really want? What are their priorities, and what concerns and challenges do they face? What external and internal factors are impacting industrial cybersecurity? What strategies and measures are being employed, now and in the future? 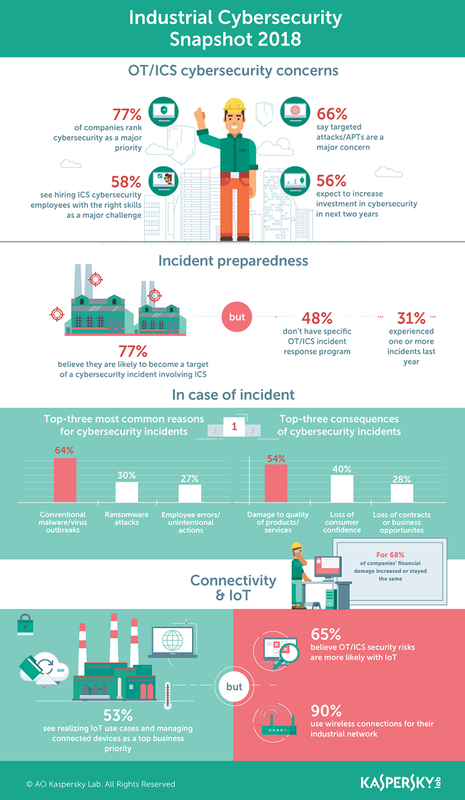 The present trend study “The State of Industrial Cybersecurity 2018” seeks to answer all these questions. It was carried out by PAC on behalf of Kaspersky Lab and analyzes the worldwide status quo and future development with regard to industrial cybersecurity. It is based on a CATI survey of 320 worldwide professionals with decision making power on OT/ICS cybersecurity, as well as 12 expert interviews. This study is annual, the first one was carried out in 2017.